Ah.. another IPA! 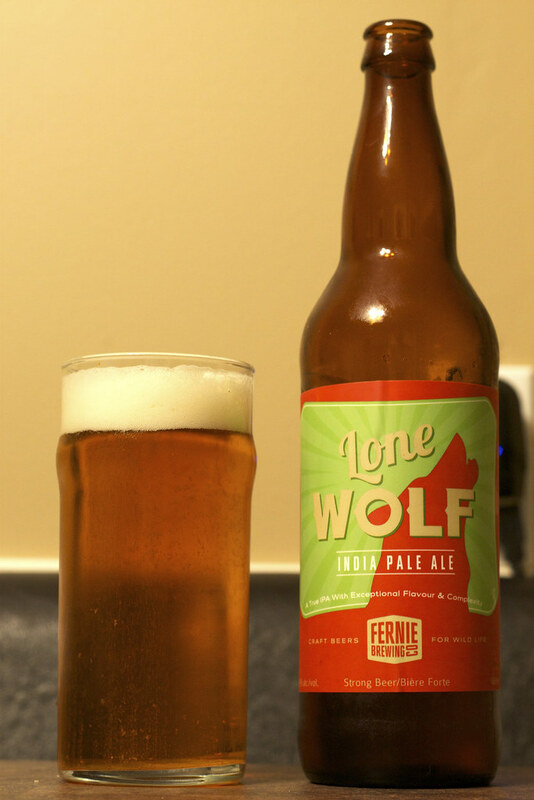 Today's IPA is Fernie Brewing's Lone Wolf IPA. Appearance: Lone Wolf pours an incredibly light golden amber, very carbonated, and a thick amount of head. Almost looks like a lager to me. Aroma: Light yet still decent, light pine notes, a bit of a grassiness, a bit of lemon zest and just of a parfumic aroma to it. Flavour: Medium amount of bitterness coming from the piney hops, notes of alfalfa, lemon, a bit of a bitter snappiness in the back and a creamy mouthfeel. Overall Thoughts: Lighter than your standard West Coast IPA, but I wouldn't turn this beer down, ever. A nice golden IPA with a decent hoppy bitterness yet very easy to drink. Could easily be used as a "gateway IPA" to move people away from Alexander Keith's. 6.5% ABV.